We are engaged in manufacturing and supplying an extensive assortment of Split Flow No Purge Loss Dryer, which is used for regeneration. Manufactured using the finest quality raw material that is sourced from our trustworthy and certified vendors, this is offered to our clients at par with the set quality standards. Available in various specifications and this dryer can be customized as per the needs of the clients. In this type of dryer incoming wet air is divided in a distributor. 60-70% of wet air goes for drying while 30-40% of wet air is circulated through a heater thereby increasing its temperature which then takes out the moisture from desiccant bed and then it is cooled in an after cooler where moisture is condensed and drained out in moisture separator. This air is sent back to the distributor where it mixed with incoming air and distributed again. No used by external air thus eliminating risk of contamination. Established in the year 2012, we “W2E Engineering Pvt. Ltd.”, are an ISO 9001:2008 certified company & recognized among the noteworthy manufacturer, supplier & exporter of a broad assortment of Industrial Compressed Air Dryer, Industrial Chiller, Heat Exchanger and Nitrogen & Oxygen Gas Plants, Biogas Plant & Ammonia Cracker. The offered range encompasses Bio Gas Plants Dryers, PSA Type Nitrogen & Oxygen gas Plants, Low Pressure Dryer, Blower Reactivated Dryer, Heat of Compression Dryer, Heatless Air Dryer, Air Chiller, etc.These products are designed and fabricated using high grade components and latest technology in conformity with international quality standards. 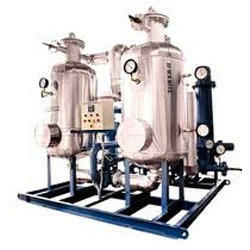 Further, the components, we use to design these products are sourced from reliable and certified vendors of the market. These products are highly demanded in the market due to their consistent performance, sturdy construction, less maintenance, easy installation and longer service life. We offer these products in standard and customized forms.